THE POP GROUP – FOR HOW MUCH LONGER….DO WE TOLERATE MASS MURDER? “The Pop Group were a British post-punk band from Bristol, England, formed in 1978, whose dissonant sound spanned punk, free jazz, funk and dub reggae. Their lyrics were often political in nature. Formed by Mark Stewart (lyrics, vocals), Jon Waddington (guitar), Gareth Sager (guitar), Simon Underwood (bass) and Bruce Smith (drums, percussion), they issued their debut single, “She is Beyond Good and Evil” on Radar Records in March 1979. Their debut album Y, was produced by Dennis Bovell to critical acclaim but low sales figures. Although it did not chart, the album’s success was sufficient to convince Rough Trade to sign the band, but not before more line-up changes, with Dan Catsis replacing Underwood on bass. 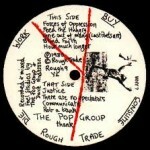 The band’s career with Rough Trade commenced with what is possibly their best-known single “We Are All Prostitutes”, which featuring a guest appearance by free improviser Tristan Honsinger on cello. This was followed by the release of their second album, For How Much Longer Do We Tolerate Mass Murder? in March 1980, which included a contribution from US proto-rappers The Last Poets. This is the first in a series about how my local libraries (Baillieston and Shettleston) afforded me a wonderful musical adventure and the huge impact they made on me. I joined them as a 16 year old because I couldn’t afford albums and borrowing from them appeared to me to be the perfect solution…which it most certainly was. I first came across The Pop Group’s second album in the racks of Shettleston library. I was subscribing to both NME and Sounds at the time but it was only in retrospect as I flicked through past copies that I came across photographs and interviews of the band which made me more aware of their interests and approach to music. It was more to do with the strange mixture of the band’s name combined with the album’s title and sleeve artwork…alarming, mysterious and confrontational. Then there was the track titles such as Forces Of Oppression and Feed the Hungry….I just had to hand over my library card (it didn’t cost anything to borrow music then) take it home and listen. WOW…for someone who only a year earlier had been a huge fan of The Jam this was intense! It was an aural assault but exhilarating, challenging and just like nothing I’d ever heard before. To my youthful ears, the heady brew concocted by Bruce Smith, Gareth Sager, Mark Stewart and Dan Catsis was a revelation on all fronts musical, lyrical and artistic. To my mind there has never been a better opening track to an album than Forces Of Oppression. With its opening chants and unrelenting groove the band creates their own ‘cold sweat’.